Since the beginning in 1946, Alliance Redwoods Conference Grounds has been a place of renewal where guests meet the Creator in His Creation. 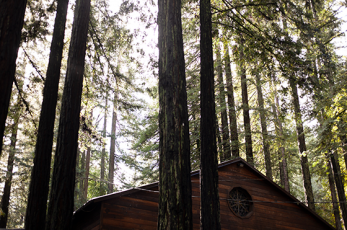 For more than seven decades, the vision has been for guests to enjoy a Christian camping experience that brings “renewal in the redwoods”. Today, we strive to provide “Service as Tall as Our Trees” through which our guests experience God’s love. Today over 32,000 guests each year cross what we’ve coined our “bridge to life”. Sonoma Canopy Tours welcomes an additional 25,000 guests per year. How was such notable success achieved? How did the ministry of Alliance Redwoods begin? Who partnered with God to overcome obstacles? What miracles were essential to reach this point in our 70-year history? 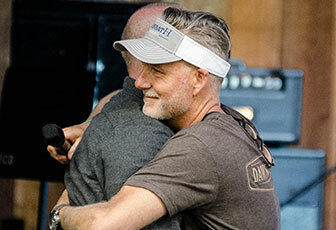 The vision for Alliance Redwoods began over 70 years ago in the hearts and minds of a few Christian & Missionary Alliance (C&MA) pastors in Northern California who were convinced that the powerful ministry of Christian camping had to come to Sonoma County. When this property off Bohemian Highway became available for purchase in 1946, they personally paid about $6,000 (the equivalent of $75,000 today) of their own money to purchase 76 acres. The pastors chose the sites for the Tabernacle, dining room, kitchen and restrooms. They also selected some lots to be leased to individuals for the building of cottages on the camp property. Immediately, volunteers began to build a camp from scratch, striving to be ready to welcome the very first guests of the summer—just three months away! As many as 80 pastors and lay men— skilled and unskilled workers—from Oakland Neighborhood Church labored to build the first rustic Tabernacle, kitchen, dining room, and restrooms. These first buildings had no flooring; just dirt floors with wood shavings from Berry’s Sawmill. The buildings were constructed using redwood and Douglas fir lumber purchased from Berry’s Sawmill. The only building already on the property was turned into a snack shop for the guests. Cesspools were dug by hand, and the first septic tank was built out of redwood lumber. Electricity flowed through old wire donated by Oakland Neighborhood Church and strung from tree to tree. No cabins were built so, campers slept in tents. Just days before the first guests arrived for summer camp, Reverend Yaggy, three other pastors, and the District Superintendent worked to dam a spring on the property to try to fill a water tank placed near the tabernacle. After the first night of camp they discovered there was not enough pressure to flush toilets or fill kitchen sinks. Something had to be done, but it would have to wait. Camp had started, and volunteers worked 16 hour days to serve guests. The following summer, during family camp, the guests donated hundreds of dollars for a pressure system which was installed the very next evening. During the first decade there was no paid labor—only volunteers with a vision. In the early years, individuals built their own cottages. In 1949, volunteers built the first camp lodgings. Later that year, Alliance Redwoods borrowed $8,000 to build Madrone Lodge. employees. In 1964, Lee Milligan was asked to live on site and serve as the first Camp Manager. rebuild? Other pressing needs included new restrooms, a new water tank, and recreation space. new kitchen and dining room which opened for use in the summer of 1966 and was dedicated to Paul Duckworth, a contractor who was instrumental in the reconstruction. professionals from the Simpson College (now Simpson University) music department. Rhoads also suggested the camp be winterized and used all year round for greater ministry opportunities. The winterizing would cost thousands of dollars that the camp did not have. Constant is the struggle between the desire to advance the ministry and the need to pay for any advancement. During the first decade there was no paid labor—only volunteers with a vision. In the early years,individuals built their own cottages. In 1949, volunteers built the first camp lodgings. Later that year, Alliance Redwoods borrowed $8,000 to build Madrone Lodge. employees. In 1964, Lee Milligan was asked to live on site and serve as the first Camp Manager. His salary was a place to live on site. His dwelling was an old cabin that was upgraded before his wife would join him. In 1965, Alliance Redwoods faced an ultimatum from Sonoma County: “The grace period is over. Replace the kitchen and dining room or board them up. They are not fit to be used again as is.” With only $117 in the treasury, how would the camp come up with the $50,000 needed to rebuild? Other pressing needs included new restrooms, a new water tank, and recreation space. That same year, Loren Berry cleared trees from the area that is now Forest Village and paid the camp $10,000 for the timber he harvested. That sum combined with a loan helped pay for the new kitchen and dining room which opened for use in the summer of 1966 and was dedicated to Paul Duckworth, a contractor who was instrumental in the reconstruction. employee. He lived on site with his wife and three children in a one bedroom cabin with wood heating. The camp’s first paid maintenance man, Robert Collburn, was provided with similar housing for his family. Rhoads hired a summer staff for the first time in 1968, and he established music camps led by professionals from the Simpson College (now Simpson University) music department. Rhoads also suggested the camp be winterized and used all year round for greater ministry opportunities. The winterizing would cost thousands of dollars that the camp did not have. Constant is the struggle between the desire to advance the ministry and the need to pay for any advancement. In 1968, the Central Pacific District of the C&MA appointed Alliance Redwoods’ first Board of Trustees including key supporters and volunteers: Loren Berry, Paul Curry, Reverend Loren Jack, Wilbur Johnston, Nate Kinser, Ray McIntosh, Reverend Carl Measell, Don Swift, and Reverend Richard Taylor. In 1973, you could almost count the number of staff members on your fingers. Five full-time couples served with two full-time men and three part-time staff. The first full-time Food Service Manager and Construction Manager were hired in the early 70s. Today Alliance Redwoods & Sonoma Canopy Tours employs 135 staff. The Construction Manager, Nate Kinser, and the new Executive Director, Richard Allen, did much of the labor in upgrading the facility and thereafter supervised the crew in the extensive upgrading of the facility, completing the proposed master plan for the 70s. Allen retired the tent frame cabins and threw out the old musty mattresses. 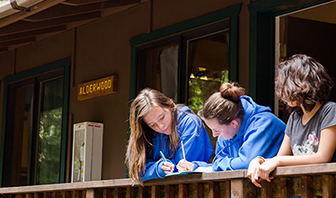 In recent decades, when schools or church groups consider coming to Alliance Redwoods, they consider how the cost compares to the quality of these four things: lodging, programming, amenities, and food. The 80s were a time of building for growth in these four aspects of the camping experience. Cottage were remodeled. Four tee pee platforms were added to Indian Village. The Outdoor Education Program began in May of 1982, and the first ropes course was installed before the end of the decade. New amenities like the Ballfield, children’s play area, and the Recreation Barn (which is now the Memorial Building) were all built during the 1980s and added to the curb appeal of Alliance Redwoods. The Marriot Corporation began providing food service for the camp in 1989. Did you know? The official mailing address for the camp was changed to Occidental, California during the 1980s. In the 1990s, the camp strengthened as an organization. Alliance Redwoods is a ministry and a non-profit business. With the annual budget exceeding one million for the first time in 1992, the camp needed to organize in a business sort-of-way! The same is still true today; if the leaders do not wisely conduct the business of operating a large camp, then there will be no more camp ministry. Thus, Alliance Redwoods took steps to strengthen as a business. Steve Daniels was hired as the first Business Administrator, and a consultant was contracted to review the effectiveness of the camp. The first Guest Services Director and first full-time Outdoor Education Director were hired. New bylaws were written spelling out the role of the Executive Director and the role of the Board of Trustees. Alliance Redwoods became an accredited American Camping Association (ACA) camp. In 1992, the first audit of the camp was conducted, and the camp obtained their first line of credit. Alliance Redwoods celebrated their 50-year anniversary in 1996 at which time the Memorial Building was finished and dedicated by the Executive Director, Mike Welsh. A one million dollar loan was granted to make this possible. Closing in on the end of the decade, more land was purchased near Big Rock Lodge for $175,000, bringing the camp’s total property to 104 acres. The annual budget exceeded two million dollars but the budget still needed to be balanced. The new Executive Director, Jim Blake, worked to balance the budget by freezing spending, reducing staff hours, switching to more affordable health care coverage for staff and he led the way by implementing voluntary pay cuts. His vision for excellent Christian hospitality was realized by building a new hospitality lounge and coffee bar for guests, remodeling the Front Desk and Gift Shop, and extending staffing to serve guests from six am to eleven pm. In 2000, Alliance Redwoods’ motto, “Service as Tall as Our Trees”, was coined by Abby Abrahams and adopted by the organization. The decade began with key hires for the executive team and record-setting numbers. Ken Kinser, Nate Kinser’s son, was hired as the Director of Operations in 2000, and in 2003, Bruce Wohlert was hired as the Business Director. Alliance Redwoods set attendance records each year from 2000 to 2004. In 2001, over 22,000 guests were served—an Alliance Redwoods first! By 2004, the occupancy rate reached 47%, and the annual budget exceeded three million. In 2002, Abby Abrahams and Mervyn Coetzee launched Camp South Africa (CSA), and the same year Outdoor Education celebrated 20 years. Multiple facility improvements were made including the repainting of buildings, a new 5,000- gallon water tank, skate park, and volleyball court. Strong attendance allowed the camp to pay off about one million dollars of its long-term debt. Still, the need for long-deferred expensive infrastructure maintenance loomed. How long could the camp delay these essential renovations with record numbers of guests using the camp? In 2001, the camp spent $40,000 on septic system repairs, but much more was needed to restore the deterioration of 60 years in every part of the camp. By 2005, the decline of the infrastructure was matched by the decline in attendance and revenue. In 2007, the camp endured water, electric, and septic system failures. The main bridge to camp was dry-rotted. Sonoma County pressed the camp to make repairs. With no cash reserves and all lines of credit spent, Alliance Redwoods teetered on the brink of insolvency. In 2008, Jim Blake declared, “We need a miracle.” Would Alliance Redwoods be forced to close after 62 years of ministry? After months of consideration a decision had to be made. The board and executive team decided to take a faith-filled risk to reinvest! Alliance Redwoods would request a huge loan—over seven million dollars—from the Alliance Development Fund (ADF) to rejuvenate the facility and the ministry. A five-year business plan was presented to the ADF over the course of two days. The plan outlined a zone of solvency through lowering prices to increase bookings, optimizing peak dates, expanding the Outdoor Education Program, and creating new revenue streams. An ADF representative stated: “You already have three strikes against you. The largest default ever on an ADF loan was an Alliance Camp. The funds at the ADF are low. Your request for seven million dollars is the largest request we have received to date.” Even more, during the presentation, a staff member knocked on the door to report that due to a recent septic system failure, the county was giving the camp 90 days to fix the problem. part of camp neglected: A new basketball court was installed in the main part of camp. New walkways, roads, and decks were added around the camp. A handful of buildings were remodeled; the Main Building was remodeled from the offices to the Dining Hall. The Operations Director, Larry Birch, was instrumental in the major changes to the Dining Hall as it looks today. A handful of buildings were also remodeled. The old Firecircle was transformed into an amphitheater. A new septic system was installed. Pineknot Village and The Slab were built. The gym was outfitted to convert to a Performing Arts Center (which is known as the PAC). Turf was added on the Ballfield, and new Challenge Courses were built. The camp-wide improvements invigorated the guests’ experience and kept them returning to Alliance Redwoods. During the crisis point of 2008, the idea of Sonoma Canopy Tours (SCT) was planted. While seeking the loan, the executive team was researching new programs that could generate new revenues. Bruce Wohlert discovered zip line canopy tours while on vacation in Puerto Vallarta, Mexico and God revealed that a recreational and educational canopy tour through the redwoods was symbiotic to Alliance Redwoods’ goals and tourism in Sonoma County. Opening a canopy tour was a key strategy in the five-year business plan to fund the renovations. In the six years since SCT opened in July of 2010, Alliance Redwoods has benefited greatly from this new year-round revenue stream. By 2012, Alliance Redwoods’ revenue had almost doubled from the peak in 2004, just before the decline began. In 2013, the camp’s occupancy rate reached 61%, and over 29,000 guests were served. Sonoma Canopy Tours almost doubled that number of guests by serving 27,000 guests. In that year, the camp spent $500,000 on facility upgrades including the construction of a new Welcome Deck near the Tabernacle. By 2014, the Memorial Building had a new laundry facility, carpets, and flooring. That same year, SCT added a new Welcome Center in the main parking lot, an additional zip line course and night tours. In 2015, The Blake family formed a team and launched Camp Nicaragua. Later in 2016, Dave Phillippy was contracted to serve on a transition team as Director of Operations. Dan Erickson was hired to serve as the new Business Director. Halfway through 2016, SCT celebrated the completion of the remodeled SCT Central and the installation of (yet another) septic system designed to handle higher volume levels as our guest counts continue to rise. Most of all we are celebrating God’s faithfulness through 70 years of Christian camping and hospitality.